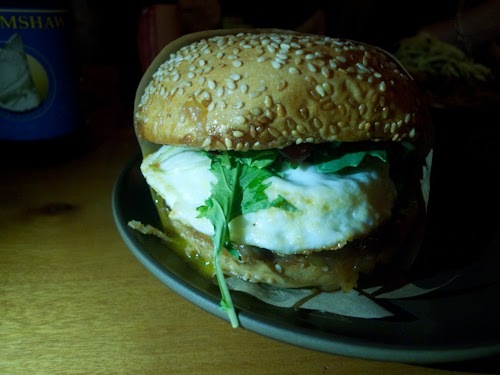 The Sunny-Side Burger from Roam Artisan Burgers features an egg on top. 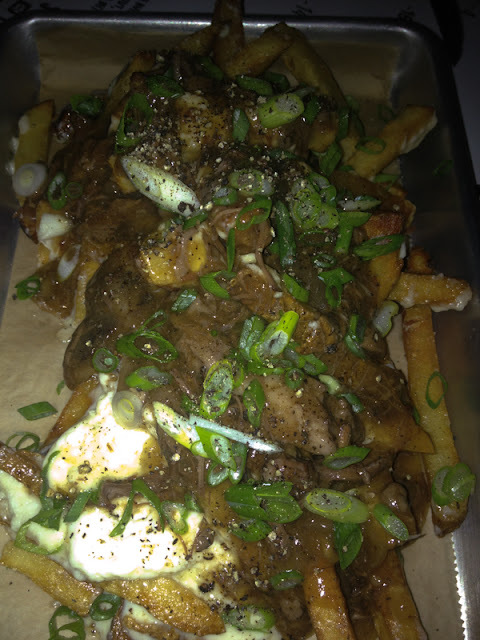 Roam Artisan Burgers on Fillmore is the second location for this San Francisco burger chain. 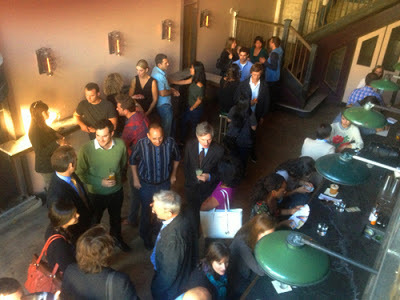 It is a warm and friendly place to meet friends for burgers, which is exactly what we did one Wednesday night. We all ordered our food at the counter and staked out 10 places at the communal table in the middle. Roam has a very nice wine and beer selection which is definitely a win. 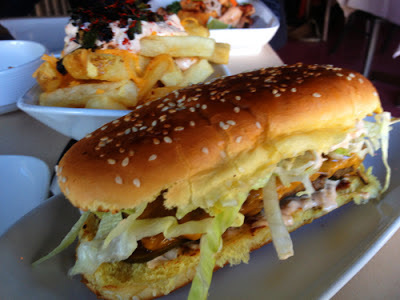 But go here for the burgers, which are some of the best I have had in San Francisco. I got the Sunny-Side ($8.25) with the beef patty, organic free range egg, aged white cheddar, caramalized onions, greens, tomato, sweet chili sauce. The patty is 4.5 ounces but seems bigger. The meat is moist and nicely spiced, cooked just the right medium. Sesame bun toasted and spongy. Sauce is just the right amount of sweet and spicy. Onions sweet and perfect. Fresh tomato slices were fresh and tasty. My only quibble would be the egg yolk should have been runny, not cooked hard. 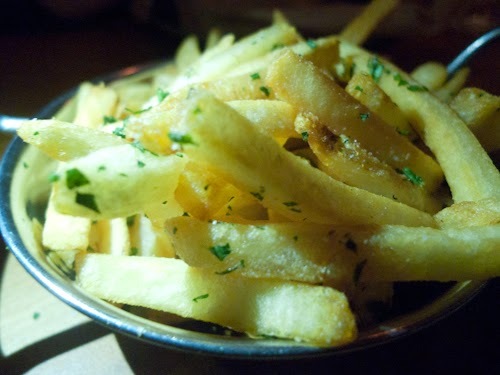 The Russet Fries ($2.99) are medium cut and sprinkled with parsley. These were not as hot as they could be. Zucchini onion haystack strings ($3.49) are ok. They were tough to eat and indeed stringy. 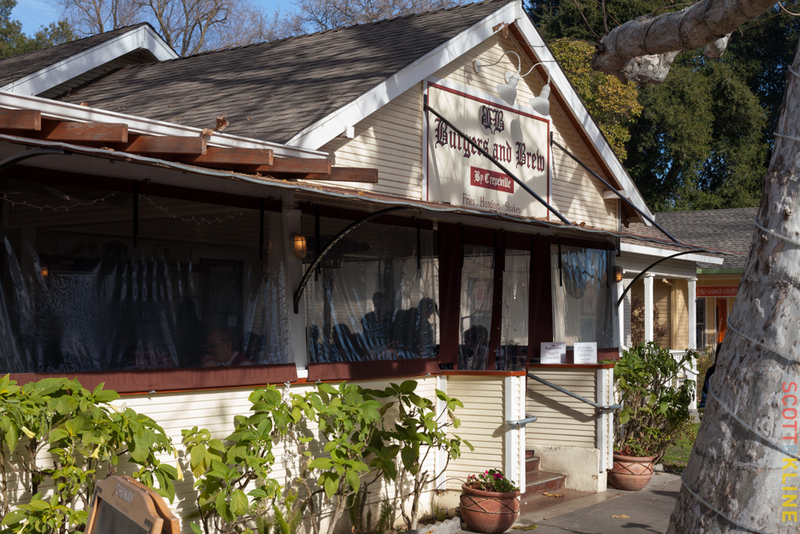 The place offers a nice choice of meats including beef, turkey, bison and veggie. I didn't consider anything but beef, but a lot in our party did. They seemed equally pleased. I will be back. Sorry for the photo quality. The place was very dark. I lit the food with my iPhone. 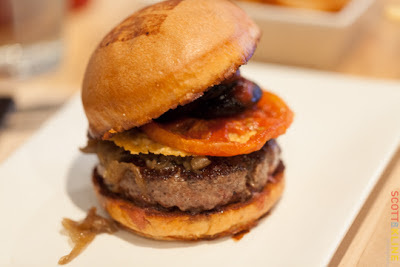 Umami Burger in the Cow Hollow area of San Francisco is one of several California locations of this upscale burger chain. The space is dark and inviting. 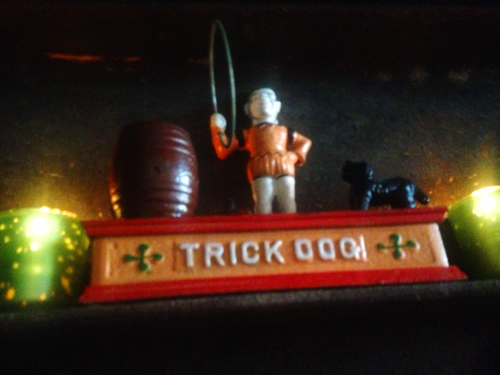 We arrived around six on a Thursday evening and to our surprise were ushered right to our butcher block table. We have eaten here several times and it can be very crowded, particularly on a weekend or later in the evening. 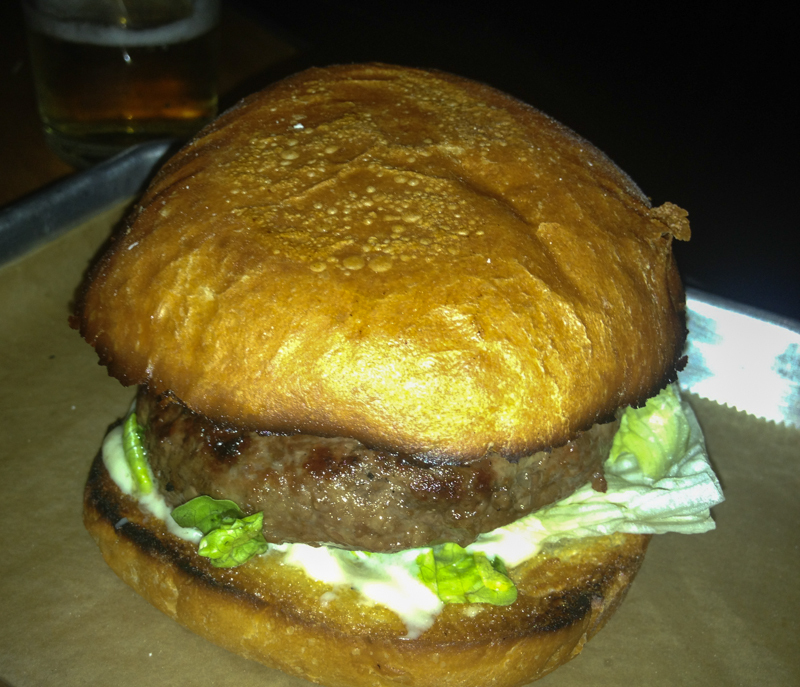 The burger arrived sitting atop a white bun, perfectly dome-shaped and stamped with a "U". The bun is finely toasted to perfection. The burger itself is a work of art. I have never seen one so finely assembled and presented. Biting into the burger, which is prepared a perfect medium rare, you get each taste hitting your tongue separately and then blending in unison. I noticed the mushroom first, then the beef, cheese and ketchup. It is really a delight. The Thin Fries ($3.50) are little matchsticks that really live up to their name. Crisp, salty and tasty, you need to eat them fast, because they don't hold the heat for long. 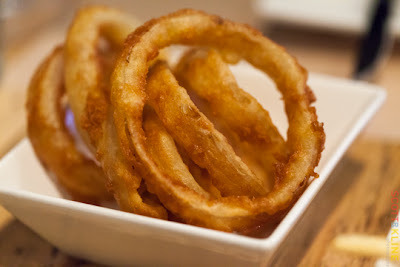 The Onion rings are surprisingly uniform in appearance. 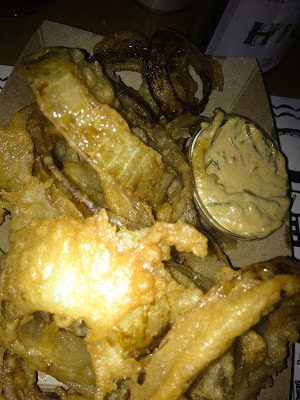 Their light batter covers and somewhat overwhelms the soft onion inside. I dunked them in the jalapeño ranch sauce and they added a nice little kick. My wife Pat had a burger with only cheddar cheese. Called the kids burger, it is the same size and bun as my burger. It is really the margarita pizza of burgers. In its unadorned state, it achieves a certain burger perfection that only works when the beef is flavorful, sparingly spiced and fresh. Skip the pecan, bacon pie. Microwaved to a tongue burning temperature, it disappointed after the quality of the rest. Crust should never be subjected to a microwave, so it was hard to tell how good it was. The bacon was more of a gimmick than an addition. 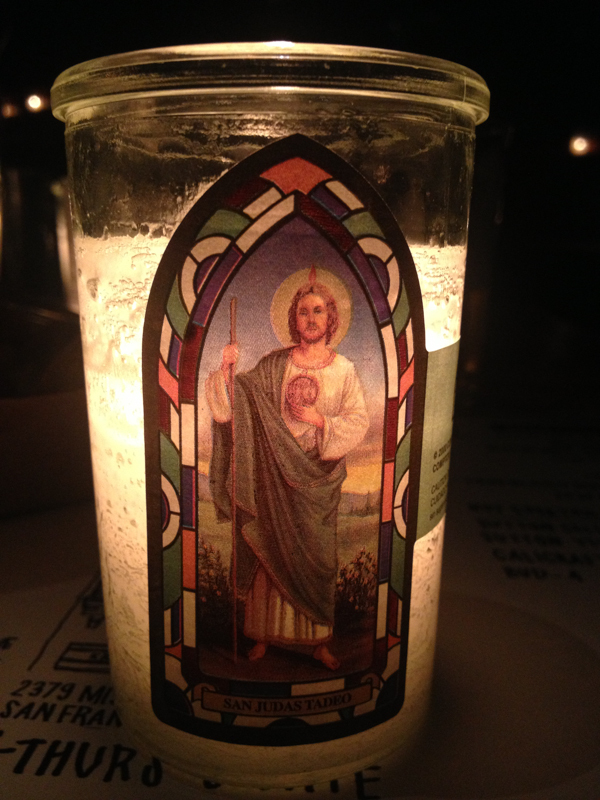 Instead, have another beer or glass of wine from the nice selection. According to Cookthink, the tastes of sweet, salty, bitter and sour are familiar, but there is a fifth taste we can perceive with our tongue. 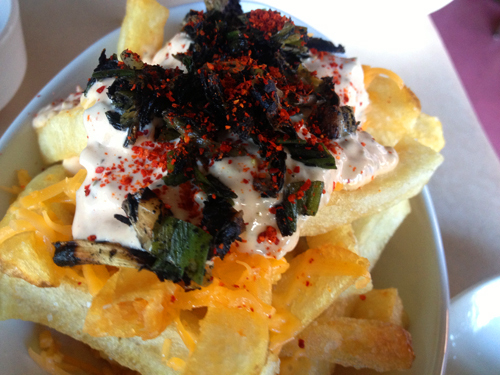 Called umami, its taste has been described as rounded, rich and savory. I think this aptly describes the Umami Burger. 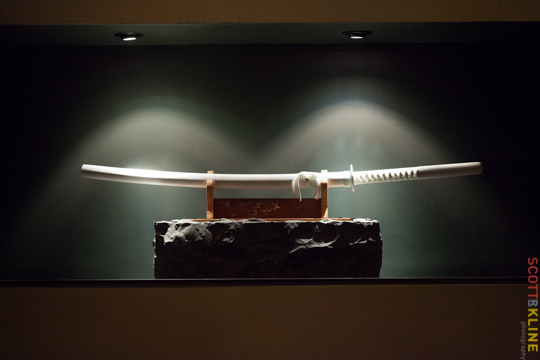 This Samurai Sword sits in the entrance. Smashburger in Thousand Oaks, CA presents a clean modern looking restaurant to have your hamburger. I liked the laminate wood grained tables and wood chairs. No faux 50s aesthetic that has become a cliché in burger places. You walk right up to the counter and order from the flat screen menus behind the server. 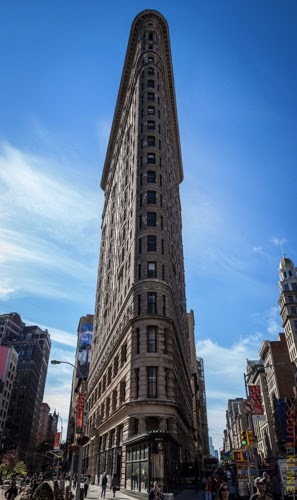 I ordered up a Classic Smash in the big size ($5.99). The regular ($4.99) is 5 ounces. The big is a half pound. They also offer a double, which is two quarter pound patties rather than one half pound ($5.99). I barely sat down and my order was there. 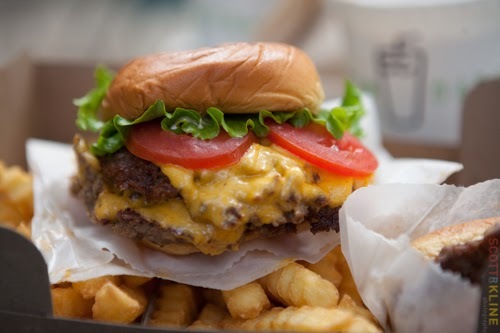 It is a nice looking burger. The yellow bun was left open with the burger on one side and all the veggies and condiments on the other. I assembled as served and took a bite. The patty was cooked through, but still plenty moist if not particularly juicy as billed. 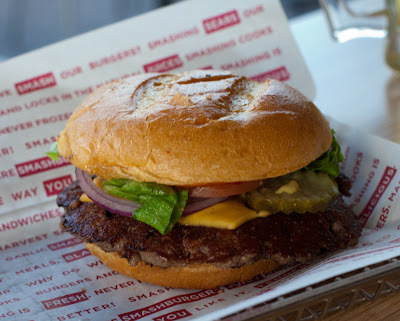 The theory on the "smash" in Smashburger is that they start with a ball of fresh Angus beef and then smash it onto a buttered griddle, searing in the flavor and juice. 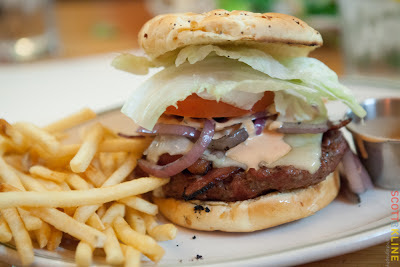 I have always thought that you compress the ground beef as little as possible to keep the patty light, juicy and soft. The thicker patty also allows more pink beef in the middle. Having said all that, this is a very high quality enjoyable burger. The meat tasted savory and flavorful. All the flavors had a nice balance with the very fresh veggies: pickle chips, green leaf lettuce, tomato slice and red onion. There is also mustard and ketchup. The American cheese was mostly melted, although it could have been more so. The Haystack Onions ($2.29) were light, thin, peppery and flavorful. Served hot and crisp they were supposed to be served with a dipping sauce, which I did not get. I had to go back to the counter and ask for it. Turns out that they were out of the containers for it and had to improvise a french fry container for it. Not a big deal, but leaving that great sauce out of the order would have robbed me of the delightful concoction. The sauce stings the taste buds with a delightful, creamy horseradish mix. The Smash Fries were the best of the lot. For a chain, I really appreciate the creativity here. 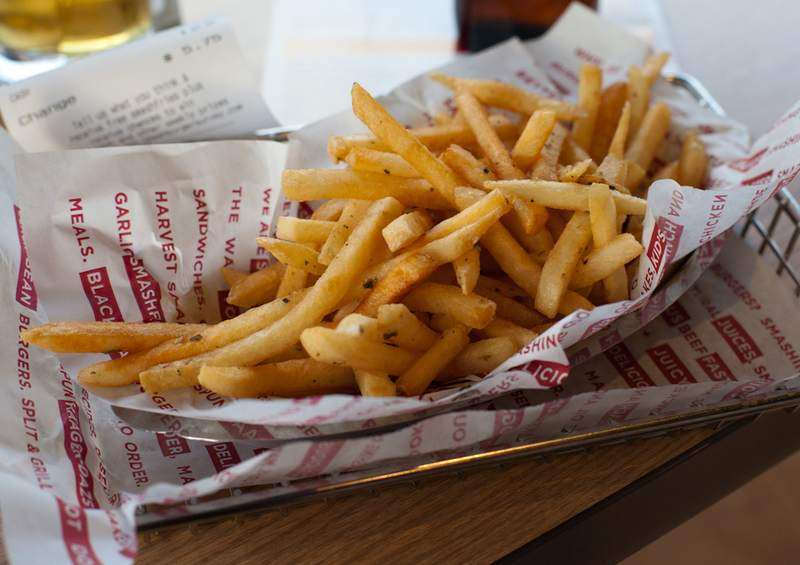 Smashburger rolls the thin, crisp fries in rosemary, olive oil and garlic. The subtle garlic didn't overpower like garlic fries. 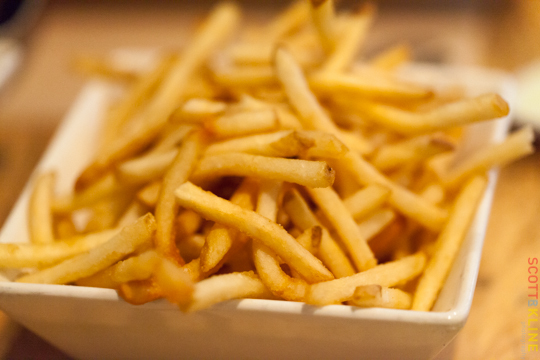 These fries would be great without the extra spices, but with them, they are a don't-miss addition to the burger. 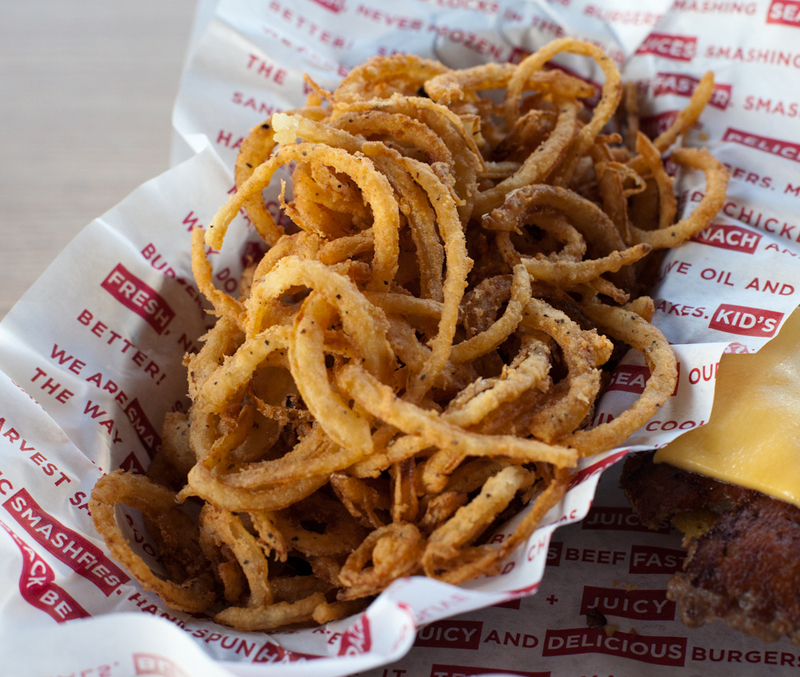 Smashburger is a worthy option against other burger chains. 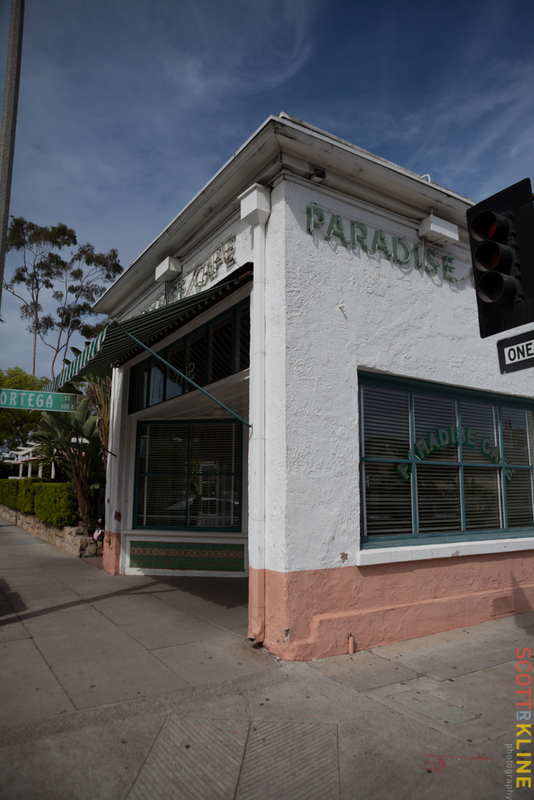 It compares well with In-N-Out and beats Five Guys in my opinion. The more substantial burger is a plus. It is more expensive than the previous mentions, but that is not unexpected given the quality of the items ordered. 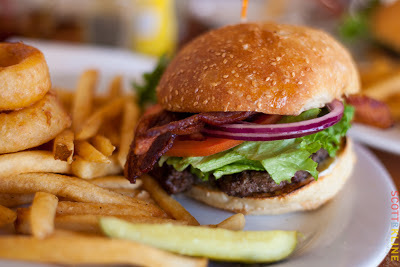 The Bacon Cheeseburger at Burgers and Brew in Davis. 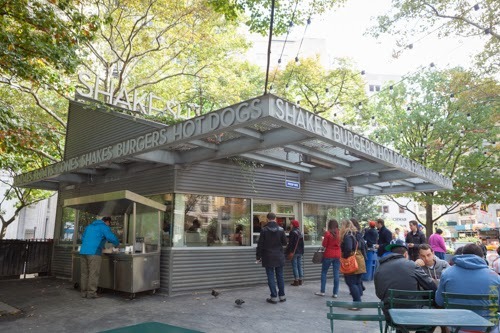 A lively place day and night for a burger. 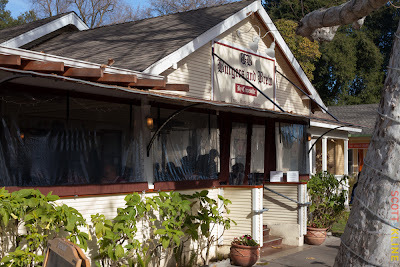 Burgers and Brew is my daughter’s favorite burger place in Davis, CA. I went up to visit her at school on a Sunday at lunchtime. The small cottage was packed. They have turned the porch into outdoor dining. But this was a very cold day at Davis, so they had plastic draped over the openings and heaters straining in vain to keep the place warm. It didn’t make the line short. Lots of people were waiting in line to order their burgers. Every table was packed. We placed our order and found a table. Our onion rings ($4.25) came out first. They were hot and battered. Slightly undercooked but crunchy, the onions on the inside were sweet. A full house enjoys their burgers and brew. Next came the burgers. Sara had a cheeseburger ($7.50) and I had the Bacon Cheeseburger ($8.75). The burgers are a half-pound of Niman Ranch beef. The patties seemed freshly and gently packed. The beef was tasty, but a little cooked past the medium I had ordered. The bun was a handsome, lightly toasted sesame bun fit nicely to the burger. Fresh green-leaf lettuce, two tomato slices and red onion slices were joined by mayo on the burger. The two strips of applewood bacon were crisp and salty. Cheddar cheese was melted, but I couldn't really taste it. I found the burger to be very satisfying and (except for being overcooked) very nicely prepared but somewhat unremarkable. The fries were crispy and hot, medium size cut and lightly salted and peppered. 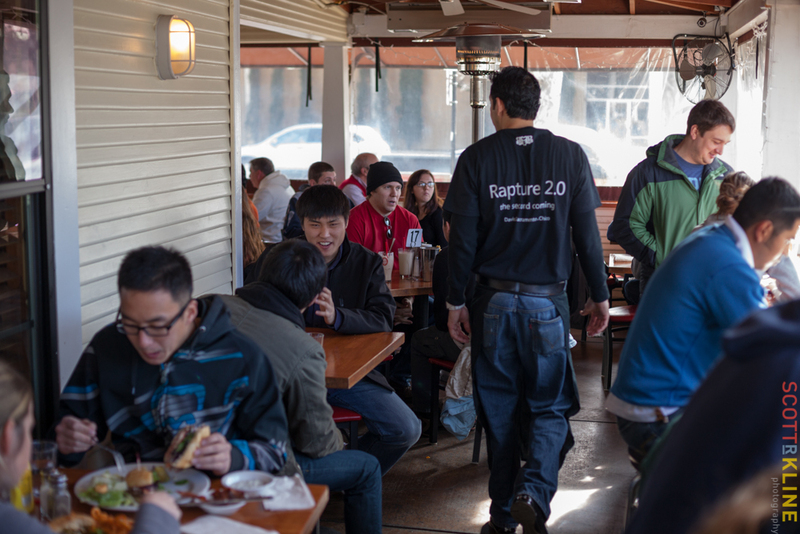 The crowd continued to keep the place packed as we finished our burger. It was a pleasant place for a burger. Sara pointed out they are open until 3 am on the weekends, which really seems to be appropriate for a college town.